Have any of you ever felt irritated by the impatient crowds behind you as you strive to appreciate a work of art in detail? Have you ever wished the print in front of you was hung in a better light without any issues with glare and annoying reflections? Have you ever hoped to cross that safety rope that prevents you from getting too close to a drawing, for fear of damaging it? 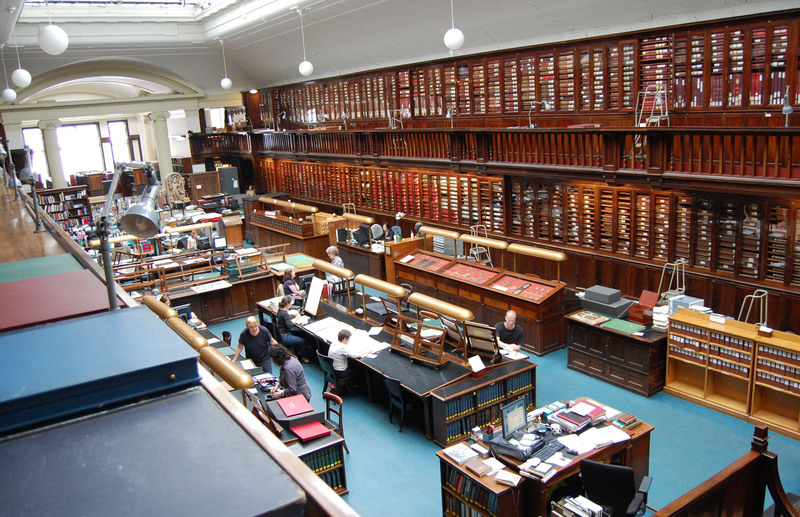 Welcome to the British Museum’s Prints and Drawings study room. In other words: your paradise. Behind Michelangelo’s giant Epifania cartoon (c. 1550-53) lies a set of double doors. You can try to open them yourself but you will fail to make them budge. To the right are two buttons. Press one of them and a member of staff will unlock the doors and let you inside. They may ask you for identification – a driving license, student ID or passport will do – before asking you to deposit your unneeded items into a medium-sized locker. Fill in the register and you will be led into the study room itself. Antique, wooden cabinets line the upper and lower sections of the walls, filled to the brim with folders containing manuscripts, old rustic books, exquisite prints and the best of all: drawings. I was led to a seat at a large table before one of the staff members came over and asked me what I wanted to see. I filled in a request slip and off he went up the stairs to the upper level to find what I needed to see. Shortly afterwards, he came down with a large folder, opened it and placed the drawing on to the easel in front of me. Two portraits by Raphael Sanzio. Own photograph. There it was, inches away from me, Raphael’s black chalk and metalpoint drawing of a female saint. I hesitated for a moment before analysing the dated piece of prepared paper, my face only a few centimetres away from the marked surface the Renaissance master had drawn on just over 500 years ago. No Perspex and no glass to protect it; just myself and the Old Master drawing. I could imagine my breath gently brushing its very surface, her inviting eyes locked in direct contact with mine. As I perused the visual surface, identifying the marks made by a metalpoint stylus and that of a piece of black chalk, I was astounded by the sheer clarity that is rarely given to us in a gallery or exhibition environment. There was no glare to distract my view and no visitors behind me awkwardly easing their way to the front. The experience was intimate, something every appreciator of art has dreamed of encountering. The chance to properly scour the details of an artwork (almost) without any limitations is unprecedented, which for a student like myself is a dream come true. I think I might move on to some Leonardo drawings the next time I visit. The environment is amazingly peaceful. You tend to get similar kinds of people there, mainly academics and students – I managed to make an acquaintance with a first-year art history student at Goldsmiths, University of London, who requested to see a book detailing prints by Francisco Goya. 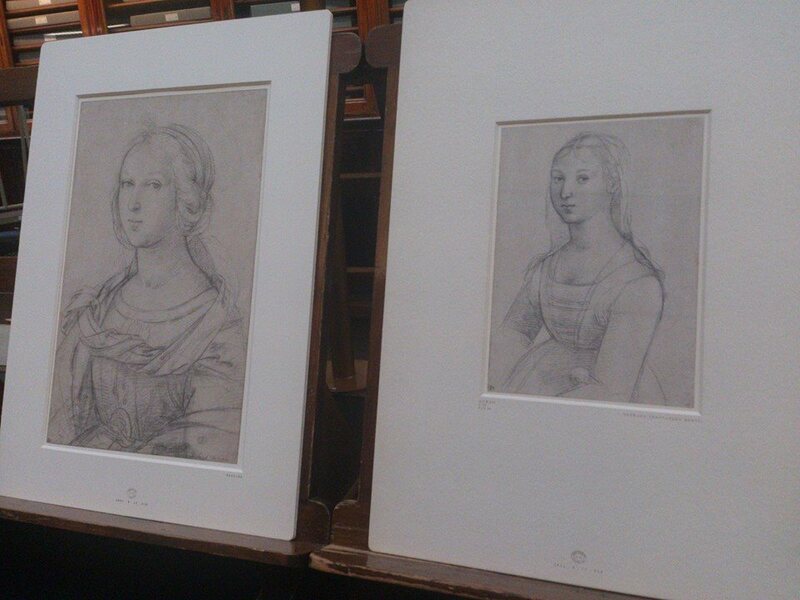 However, my Raphaels did manage to capture the attention of a local artist who so happened to be making some studies. I applied my new and existing knowledge of the two portraits I was analysing – I had requested an earlier, similar portrait for comparison – and briefly spoke about my observations. Funnily enough, I had not known he was an artist until prior to leaving when I casually walked over to his desk. Glancing yet again at the easel on my desk, he told me “I used to draw from Michelangelos”; I had requested Peter Paul Rubens’ red chalk drawing of an ignudo in the Sistine Chapel, after Michelangelo. As intimidating as it might sound at first thought – I know I had that feeling – these are facilities that are open to the general public. Obviously there are certain rules that must be adhered, such as ‘wearing gloves when handling objects’, but the opportunity presented allows for an experience that goes beyond glass display cases, overcrowding, and selective presentation. What you would like to see – provided it is in the collection catalogue – you should be able to request and see in a quiet, intimate environment. You won’t regret it. In fact, it is a bit like room service. Who knows which Old Master’s hand could be several centimetres away from your own optical devices? For more information, please visit the British Museum’s Department of Prints and Drawings webpage: http://www.britishmuseum.org/about_us/departments/prints_and_drawings.aspx. Previous Post ‘England’s Michelangelo’ comes to Canterbury!